The always lovely Clair asked me to join in this blog hop with a difference, the next "hop" is on a weekly basis. We are ased 4 basic questions, asked to answer them & then allocate (having previously asked) 3 more bloggers. I've had a lovely craft day today with friends, and was borrowing their tonic dies to make cards with. So that is the project that I am most currently working on. Its nice meeting up like this and being able to use each others tools. You'll also see a notebook on the table, in this I jot down other projects that I am mentally working on. 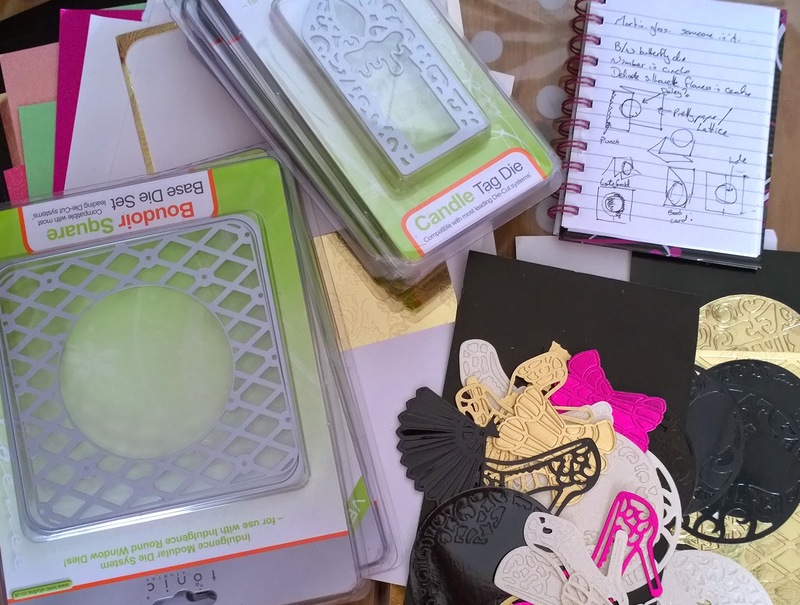 Things such as the latest ukscrappers challenges with ideas of what I want to do, any current blog challenges, ideas I've spotted - most of which are currently scrapbook related. You see I forever strive for organisation, being a messy person this is quite a hard thing to do & maintain, but part of being organised is getting each year of from my life scrapbooked, I am slowly getting there having got to 2007 working backwards, and I'm almost upto date with 2014!! What a tough question, like something from a job interview! I would have to say its taking my time, I can spend a day on a small area of a scrapbook page to get it just how I want it, such as creating a 2d version of optimus prime in paper to use as an embellishment, how I'm happy to make my own embellishments or background if I havent got anything suitable in, & my eagerness to have a go at ANYTHING craft wise, I love trying new things, play with a variety of mediums & types of crafts, I always try to think outside the box. I was born into a crafting family, my Mom would sew, embroider, bake & knit, my Dad would crochet, my Nan would make leather embellishments for bags and similar, knit, crochet, sew etc how could I not pick up the bug. From as young as I could remember I would love sticking things together, trying new crafts. My scrapbooking started when my Grandad died, its something I'd been considering but when he died I realised that he and my Nan had so many photos that no-one would know who were in it or what was happening, that when my Mom passes it would be the same with her photos, and the same with mine! So I decided to make a record of our lives my my children. Some of the pages may trigger memories, others will let them know a bit about people like my Dad who died when my eldest was so very very small. Once I have got back as far as I can I hope to research my family tree & scrapbook that next :) Most importantly though its relaxing, its part of my life that doesnt worry me & stress me out which as a stress head & a worry wart is very important. Its a release, if I dont get to create things I feel pent-up, depressed and on edge. What is my creative process? Its starts with inspiration. If I havent been inspired I go find it. I can find it in all sorts of places, on a blog, in a challenge, on pinterest, in a sheet of patterned paper, a photo, or just in the fact that its a rainy day & theres nothing nicer than sitting with a pile of paper, some tape, photos & getting stuck in. With scrapbooking I'll either find a sketch or make one to go with a particular photo(s), then decide on the papers, what embellishments I need (& then make them if necessary), then title & journalling. This may sound like a fairly quick process but it takes me aaaaaages. So thats me, next you get to go visit my good friends and uks team mates, but WAIT! They'll be posting theirs in a weeks time, on Monday 16th (why yes, of course I'll remind you all). First there's Ruth. Ruth & I first started chatting on Moneysavingexpert.com, joined in our appreciation on saving money, card making & Christmas. We both started scrapbooking at around the same time. We've met several time sin real life & even allowed our famillies to meet!!! We're firm friends who rarely go a week without chatting, giggling and putting the world to rights. She's a fellow scrapbooker and cardmaker, which is great when either of us need to throw ideas round. Then theres Fay, who I met at a crafty bloggers weekend away. She has become part of our UKS team, and is always part of our team chatter on facebook. A talented lady who sews and scrapbooks. I am always impressed by the clothes that she makes for her children.How does my creative process work? Oh that was a fabulous write up - I love the transformer layout - labour of love and well worth it! Okay, so firstly, I cannot believe that you MADE that Transformer. That is freaking awesome, my friend. Secondly, thanks so much for joining in with the blog-hop. It has made my day learning a little bit more about you and your creative process. And understanding why you scrapbook? Well, those are all very special reasons! Road Trip, & the hop keeps going.